This 3-day workshop is perfect for those who have some basic experience in oil painting and want to continue to learn great landscape techniques. In this class, Mike will teach his students how to capture the dynamic beauty of movement in water. 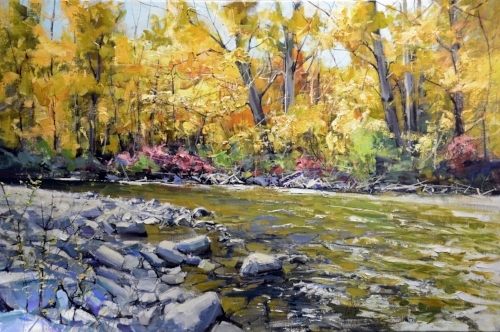 From quiet babbling brooks to rushing rivers and even waterfalls, students will learn Mike's techniques to paint rapids, rocky river bases set against shores filled with twigs and branches and the surrounding forests. Using palette knife, brayers, shapers and brushes Mike will guide his students in dynamic, textural oil painting. With attention to composition, color harmony and finishing techniques, each student will learn concepts to develop their knowledge of impressionist oil painting. 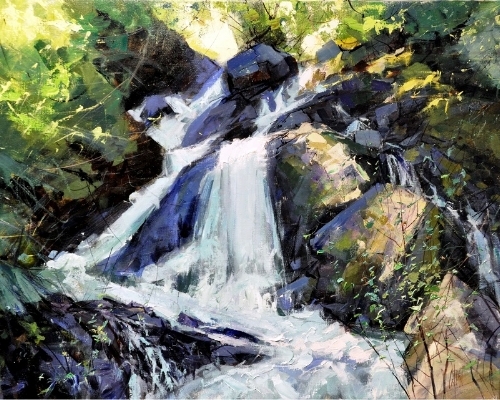 Mike will also demonstrate and teach layering, both wet into wet and wet over dry, as well as more exaggerated techniques for dramatic effects. Some experience in oil is highly recommended. Oil Paints – Good quality professional brand such as Gamblin or M. Graham. 2 or more good quality canvas panels* in a medium weave - your choice of sizes in this range: 11x14 to 16x20. IMPORTANT: Make sure your canvases have a good good priming - either buy the Source Tek canvas (which are highly pre-primed) or, if you select a different brand, make sure they have an additional coat of gesso for the priming so they are not absorbent and stain. Also note that the smoother or finer the surface is the more difficult it becomes to layer paint so a medium texture will work best. Reference photos- these need to be large enough to see the details, small 3x5 photos are not suitable. Photos should have an overall strong simple design. Surgical or Exam gloves (Mike also uses his fingers to blend with) **We have standard sizes at the Gallery if you don't have gloves available.